I grew up with the German Kaffee time – usually around 4 o'clock on a weekend or summer afternoon. If the weather was good, we'd get out a blanket and sit under the cherry tree out front. The adults would drink coffee and everyone would eat slices of cake. It's a good tradition, and I follow it pretty religiously when we visit Germany and Austria. Even at home in Canada, we often have coffee, tea or hot chocolate around that time on weekend afternoons. So when I heard about a new book called Fika – about the Swedish coffee time – I had to check it out of the library. It's a bewitching little book full of lovely illustrations . . . reminding me yet again how the right illustration can say so much more than a photograph. 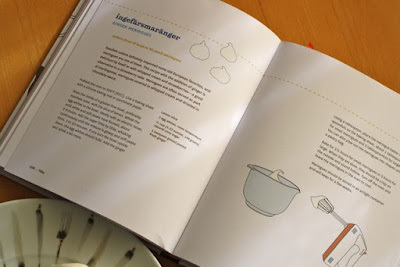 I've got my eye on quite a few recipes, including oat crisp chocolate sandwich cookies, hazelnut coffee cake, chocolate buttercream almond rounds, and a sticky chocolate cake with poppyseeds (!) on top. But last weekend, Scott brought orange sorbet home from the grocery store, and I remembered the ginger meringues. Almost before he put the groceries away, I was in my corner, wiping the stainless-steel mixing bowl with a slice of lemon and separating eggs. 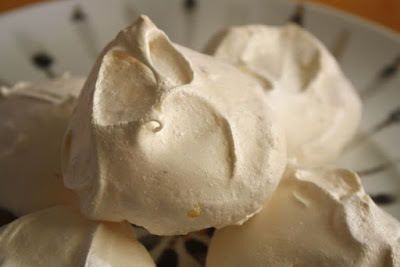 The meringues were incredibly easy to make and their beauty – whipped clouds with tiny flecks of ginger if you looked hard – was so satisfying. We ate them that night with the sorbet, and the ginger and orange soon became good friends. But the next day, we had them as part of a lazy Sunday afternoon with coffee and tea. Of course, they were perfect for fika or Kaffee. P.S. 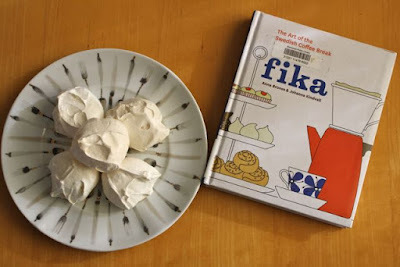 If Fika showed up in my stocking this Christmas, that would be one smart Santa. Just sayin'. Preheat the oven to 200 degrees Fahrenheit (95 degrees Celsius). Take out one very big or two regular cookie sheets and line with a silicone baking mat or parchment paper. If you have a stainless-steel bowl – or a regular grease-free bowl – wipe it with the lemon. Discard the lemon. Beat the egg whites until they form soft peaks, about 2 minutes. Slowly add the sugar and keep beating until it's glossy and you see hard peaks. Beat in the ginger. Use a tablespoon to plop the meringue batter onto the cookie sheet. About 1 tablespoon makes a small meringue and about 2 tablespoons make a large meringue. Bake 1 1/2 hours for small and 2 hours for large. They should feel crisp on the outside and sound hollow when they're done. Leave them in the oven to cool down after you turn the oven off. Store in an airtight container for a few weeks. Hello dear dollop of cream. Its been a while since I've checked up on you. These meringues look amazing and what a great pairing with Scotts orange sorbet. I have to ask. ..what is the significance of wiping the bowl with lemon? Will we see you in Vancouver any time soon? Leita! We miss you and Ge. Alas, no Vancouver trips in my near future. Good question about the lemon ... I think the acidity might help the egg whites set up into meringue and impart a subtle flavour. I've always wanted to take a chemistry of food course -- then I'd know the answer! Dollops of hugs to you, too!